Creatistics branded Australian made, non-toxic, washable watercolours provide both brilliant colour and hours of creative fun to any classroom or home. 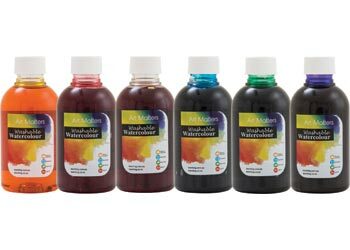 Comes in a set of 6 everyday colours in 250ml bottles; red, yellow, orange, green, blue & purple. These can be used in a variety of ways including watercolour painting, tinting pigments or as craft dyes. They can be used on a wide variety of surfaces including paper, cardboard, glue, fabric, wood, wool and polystyrene based products. Apply these watercolours using a variety of different applicators including brushes, spray bottles, droppers, pippettes and sponges. These colours are washable from skin and fabrics. and are intermixable to create more colours. Each bottle is 250ml and comes in an environmentally friendly PET bottle.